Quality products at affordable prices. No products contain any animal derived ingredients. Packaging and prices may vary from that shown here. We endeavour to be enviromentally friendly as possible so we do not have expensive packaging which also keeps the cost down. Minimum mail order is $19 (excluding postage). Mail order payments may be made by credit card, cheque, money order or bank transfer. We do not have Paypal. Royal Melbourne Show: Held late September/early October, in Melbourne, VIC. If attending, you can also purchase one of our exclusive and fantastic showbags - ONLY available at the show! We have been wholesaling our products thoughout Australia and overseas since 1996. If you are interested in selling our products, please contact us for a current wholesale price list. Wholesale prices only apply to those selling a range of our products. Discounts off the following prices apply to large purchases of a limited range. Products are available with or without labels, bottled or bulk. Minimum mail order is $19 (excluding postage). Mail order payments may be made by credit card, cheque, money order or bank transfer. We do not have Paypal. Postage costs are: $8.00 (500gm), $14.50 (up to 3kg), $17.50(up to 5kg). Postage costs advised for larger quantites. *Get a 25% discount on organza bags when you buy our dried lavender. All candles made in Australia. $25.00 Made from durable natural jute. 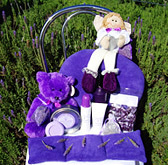 $1.00 each* 5 for $4.50* 10 for $8.00* Get a 25% discount on organza bags when you buy our dried lavender. $10.00 10% discount when buying $40.00 or more from this range. $20.00 Machine washable satin polyester. More avaible in these designs. $13.00 Made in satin or polar fleece. $29.00 Made in polar fleece or cordroy. Heat packs contain lavender and wheat. Regular heating will gradually diminish the lavender scent. Renew the scent by putting 1 drop of lavender essential oil on the heat pack AFTER heating. Get 25% off Essential Oil (Angustifolia-French) 15ml when purchasing a heat pack. 1 per heat pack. We can make gift hampers from your choice of products. Smaller gifts can be made up in various baskets or boxes. +$4.50 Packaging cost added to your choice of products. $2.20 Discount available on this range when you spend over $150. $2.00 Please contact us for further details. $2.20 Bottle dimensions available upon request.